Exquisitely unique bridal wear, designed and created exclusively for you. Perhaps you long for a corset extravagantly embellished with fine lace and Swarovski crystals, or maybe you’re in need of an elegant gown in a beautiful coloured silk (and the shops only sell white!) – Vanyanís can turn these dreams into reality. Our Bridal Couture service allows you to work with Vanyanís designer, Lowana O’Shea, who will create you a truly unique wedding gown, fitted to your figure and needs. See our gallery below for examples of our couture work and aesthetic. 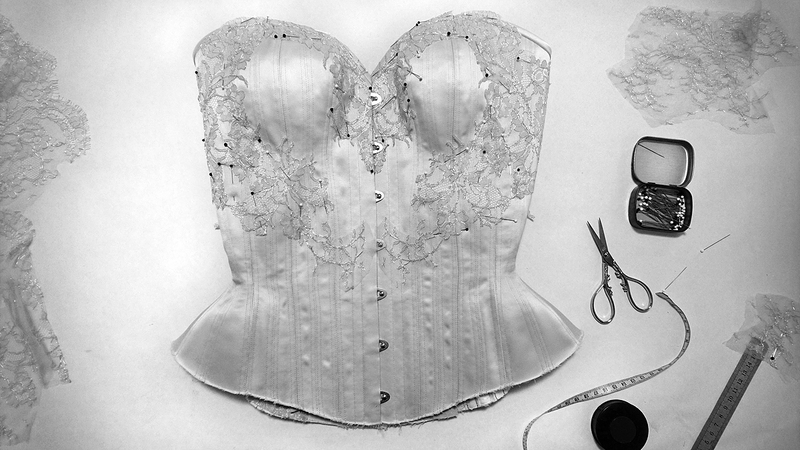 We believe in designing for the individual and lovingly create bridal gowns, dresses and couture corsets to suit you. Brides come to us because they fall in our love with our romantic, dreamy designs and attention to detail. Making you feel like the very best version of yourself is what we do best. In order to ensure you receive a truly personal experience, we offer extremely limited spaces each year for bridal work. If you love what you see here and would like Vanyanis to create a wedding gown, designed and fitted just for you then please contact us to discuss. Real bride Lowana in her couture Vanyanís gown. Real bride Amber, in her Vanyanís couture gown. Click on the images below to view more photos and find information about each of these featured heirloom bridal gowns. Each gown has been designed in the Vanyanís aesthetic for each individual bride, taking into account her own personal style and shape. We believe a wedding gown should be a reflection of you, and as such we never repeat a design (because you are unique). Therefore, we recommend viewing our gallery as a source of inspiration and guide to our aesthetic that may be used as reference when we design a one-of-a-kind gown for you. So you’ve fallen in love with the luxurious, subtle and detailed nature of our designs and desire Vanyanís to create an exquisite piece of couture for your very own, perfectly fitted to your figure. There’s no one in the world quite like you, and you deserve a one-of-a-kind gown just as unique to wear on your wedding day, and to treasure in the years to come. The following prices are a guide only and actual prices will vary depending on your unique design. All prices are in Australian dollars and are inclusive of design consultations and fittings. For the bride to be who wants the delicate charm of good design and the confidence that the perfect fit bestows within a reasonable price range. Quality fabrics and expert craftsmanship work together to create a truly special gown or dress that is uniquely you. Popular amongst brides, a corseted gown creates a stunning silhouette and provides comfortable support for your figure (no need for complicated shape wear or strapless bras!). A corseted wedding gown is a stylish base for lavish embellishment and detail. 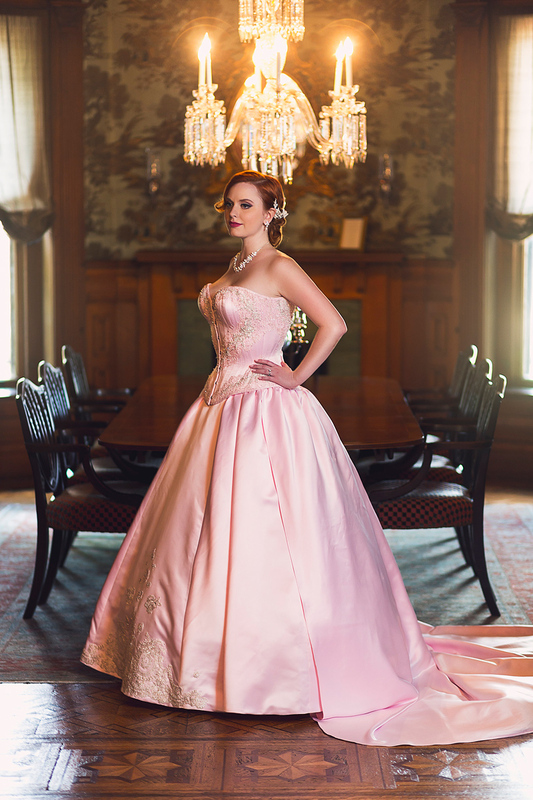 For the bride who wants the thrill of extravagance and heirloom gown like no other. Often taking hundreds of hours of careful work, gowns in this category give us the freedom to create the most lavishly detailed bridal couture; the best of the Vanyanís aesthetic made for you. To ensure you receive a truly personal experience, we offer extremely limited spaces each year for our bespoke brides. Please see below for our upcoming availability. Should your preferred date be booked out, please feel welcome to contact us using the form to go on our waitlist as in the event of any cancellations we may be able to fit you in. Work on your bespoke wedding gown usually commences six months before your wedding as there are many weeks of careful work and several fittings with you required during this time. Should you require a quicker turnaround, please feel welcome to ask as a ‘rush’ order may be possible. Acceptance of urgent work is at our discretion and will attract a premium charge. We understand the importance of punctuality and refuse to disappoint once commissioned, therefore we will not accept urgent work if we do not feel certain of meeting your deadline. As our schedule is very full, and booked out months in advance, your place in our schedule can only be confirmed upon payment of the initial 20% bridal deposit. We work on a ‘first-deposit-paid, first served’ basis and regret we cannot hold a place in our schedule without payment of this initial deposit. The ‘queue’ deposit counts towards the total cost of your commission, with a full deposit to the value of 50% payable before commencement of work. Read the Bespoke Terms and Conditions here.